Our “Preventive Maintenance Agreement” is the best way to prolong the life of your equipment, to protect against costly breakdowns and to promote maximum heating efficiency and safety. Discounts - Customers with Service Agreements receive a 10% discount on repairs. Prompt Service - Breakdowns become a remote possibility, but should you ever need service, you get it fast. Customers with Service Agreements receive priority. Seasonal Check-ups - Your residential comfort system is inspected and serviced twice a year, prior to the heating and cooling seasons. 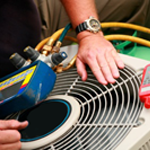 As a result, your system provides many additional years of safe, efficient, and reliable service. Energy Savings - With regularly scheduled maintenance, your unit is certain to operate more efficiently and with less power consumption. Clean air filters assure maximum air flow while unrestricted indoor and outdoor coils make heat transfer easier. Studies show that a system will lose 50 percent efficiency if not maintained regularly. Click here to view our service agreement program. Wade Hatchell Heating & Cooling, Inc.